The Global Village Construction Set (GVCS) won our Green Project Contest at the beginning of 2011, garnering the most votes of all the eco-friendly projects submitted. Marcin Jakubowski founded Open Source Ecology, a network of farmers, engineers, and supporter, whose main project is GVCS, “an open source, low-cost, high performance technological platform that allows for the easy, DIY fabrication of the 50 different Industrial Machines that it takes to build a sustainable civilization with modern comforts.” GVCS is like a life-sized Lego set, and each of the machines uses interchangeable parts, motors, and power units. 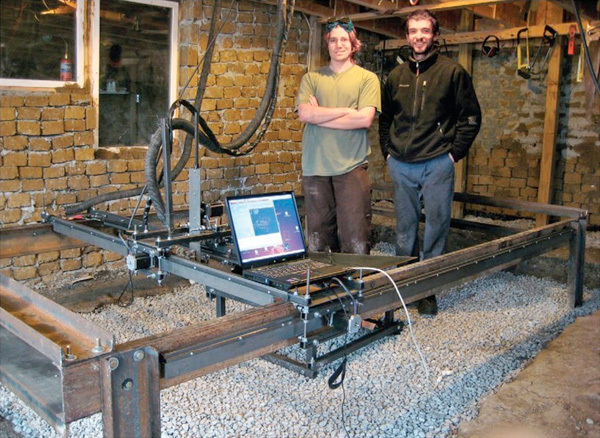 A few of their machines have been featured on the pages of MAKE. Jakubowski (pictured above at right alongside Lawrence Kincheloe and the open source plasma cutter) is immensely busy, to say the least, but he took the time to answer a few questions for us and give us further insight into OSE’s massive undertaking.